Can GULL support social enterprise? YES! 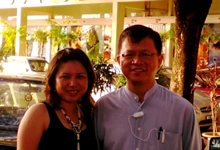 This is the story of Joy to the World Community Services (JWCS) Malaysia, founded by Pastor Joseph Tang and his wife in the early 1990s. It began without any funds or resources and although Joseph pastors three small churches, he knew that his congregation could not afford to support a wider ministry to orphaned children. Today, JWCS cares for more than 100 people and the work is expanding rapidly. It now encompasses the elderly and people with special needs. Joseph will not turn anyone away who is in need of love, shelter and care. From the outset, Joseph sought to address the funding problem by developing a unique social enterprise model. He calls this ‘TSR’ – training, service and revenue. First comes love and acceptance: Joseph, his family, staff and volunteers try to reflect God’s love in action. Next JWCS focuses on skills – for life and for work so that everyone has a practical role and the youngsters are prepared for life. Joseph and his family live in a busy, happy community house. In fact, this modest property is home to 43 people. As we drove up to the house, a gang of small boys rushed over to greet us and threw themselves at Joseph who they call ‘Papa’. As you enter the house it is amazing to see yet more small boys working away – one youngster was at the top of a ladder cleaning the windows, another was cleaning a fan. Others were cleaning and sorting an array of old toys, bikes and other donated items that JWCS recycles. This is Joseph’s model in action – everybody is doing something productive – to build life and practical skills, self-esteem and to help support the Tang mega family! The Tang family home the ‘House of Joy’, values everyone and lively youngsters learn to live with, love and respect the children, teenagers and adults with special needs. Joseph told me about one lady who lives at the house – a former teacher – who had experienced a complete mental breakdown. She had no where to go and someone brought her to JWCS. She sits motionless and silent in a corner, but Joseph knows that in time, she will respond to the sense of love and care that permeates this amazing house. As father to a household full of disadvantaged people, Joseph sees his role as a ‘talent spotter’ he focuses on identifying the talents of each individual and builds these up. He even taught himself brick laying and car maintenance so that he could coach and encourage his orphaned boys and help them to develop practical skills. JWCS has a refuge for women, all of whom have special needs. There are currently 19 residents ranging in age from 13-38. Some came because their parents could no longer cope or care for them, others were unwanted, several had been raped and needed protection. JWCS funds a supervisor and with the support of volunteers this too is a happy, friendly place to visit. Some of the women will spend their entire life at the refuge and every resident is given the opportunity to undertake paid work as a house cleaner so that they have a personal source of income and feel that they have a role to play in society. Joseph and his team set-up the training programme, established the house cleaning service and there are now many long term customers who appreciate the professional standard of house work that is provided. 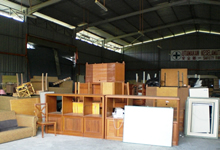 Meanwhile, Joseph does not want to waste the space and so he has filled the warehouse with furniture that has been donated by hotels in Kuala Lumpur. Some of this furniture has already been given away to families in need of tables, chairs, beds etc. The rest will be sold to held fund the conversion work. 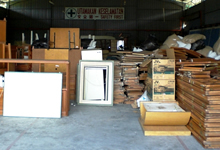 Furniture recycling on a grand scale! The temperature in this warehouse is around 35 degrees centigrade but everything is moved by hand. As noted earlier Joseph, his family and team are dedicated to providing a firm foundation for the disadvantaged people in their care. But it doesn’t stop there! As the children reach their mid-teens JWCS supports career development in many ways. Some eventually go to university, others are found placements in factories or offices and some learn the skills to start their own businesses. Joseph wants to turn these fledging businesses from a mini market to a hyper market of talented, enterprising youngsters. Joseph has established a video production team (below left) and helped to secure commercial contracts for his learners to work on. Craft and Jewellery-making is also popular and here, professional volunteers pass on their skills. The girls (centre, and right) are sisters. Up until the age of 13 they had hardly been to school as they were compelled to care for their disabled mother and baby brother. Now they are ready to start their own business! 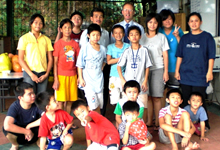 Joseph has developed an extraordinary care organization that is a thriving social enterprise. He knew that donations and funding would be difficult to obtain and in any case, he wanted to equip those in his care with the skills to play a full and valuable role in society. Our last tour stop was at the Oasis café (pictured below) where businessmen gather for a coffee or a meal (prepared and served by Joseph’s youngsters) and to offer financial assistance, work placements, business advice and other forms of support. I talked to some of these businessmen and they greatly admire the spirit of endeavour, innovation and creativity that is helping to transform the prospects of people (especially the youngsters) who were once unloved and had little hope for the future. Joseph has a bigger vision though. He wants to develop a fully fledged enterprise school so that many more disadvantaged teenagers can learn the practical and technical skills needed to start their own businesses. How is GULL supporting Joseph’s ambitions? 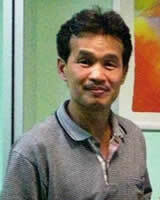 GULL Asia is now working with Joseph to help him create his own enterprise school. His TSR philosophy of social enterprise (training, service and revenue) underpins the desire to see each and every disadvantaged person equipped with as many life, practical and technical skills as possible. The objective is to raise self esteem, confidence and a sense of purpose and optimism. 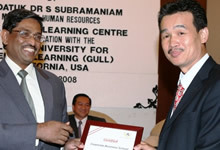 JWCS believes in active, practical learning and, via the GULL system we can relate the practical learning outcomes (e.g. a photographic portfolio of the development of skills in jewellery-making) to professional certification at Certificate or Diploma level. As we can SEE the learning outcomes, we don’t need those with learning difficulties to capture their learning in conventional written outputs. The important point is the tangible, trackable evidence and the fact that Joseph’s learners can DEMONSTRATE their learning outcomes. The JWCS enterprise school reflects GULL’s core mission to recognize learning in the community and among the poorest and disadvantaged. It is a privilege to play a role in supporting this extraordinary work. Featuring GULL’s work in the community: Joy to the World Community Services has established its own Enterprise School using the GULL system.